I only realised my ‘sandwhich’ typo after I uploaded my video but I’m far too lazy to go back in fix it so it’s stayin! Aaaaand we’re back from Malta! I don’t mean in a just-eat-real-food kind of way though I’m excited about that too. It’s just nice having proper meals with veggies again after getting back from vacation. While we were there we relied mostly on sandwiches, nakd bars, handfuls of cereal to keep us going. As lovely as a time we had there soaking up all the Vitamin D I could get it’s good to be home again. It’s always nice being back at home sleeping in my your bed, using your own shower and cooking in your own kitchen – don’t you think? Even better being home with such tasty food sitting in the fridge like this Avocado Chicken Salad. This salad is suuuper easy to make made with only 9 ingredients (two of those being salt & pepper and those barely count) and about 25 minutes to make. If you use precooked chicken your prep time is even less too – more like 5 minutes! It’s not too unlike a chicken salad with mayo – like the kinds your make sandwiches out of. Except instead of mayo we’re just using smashed avocado and lemon juice here. A quick, easy swap without any compromise on flavour! 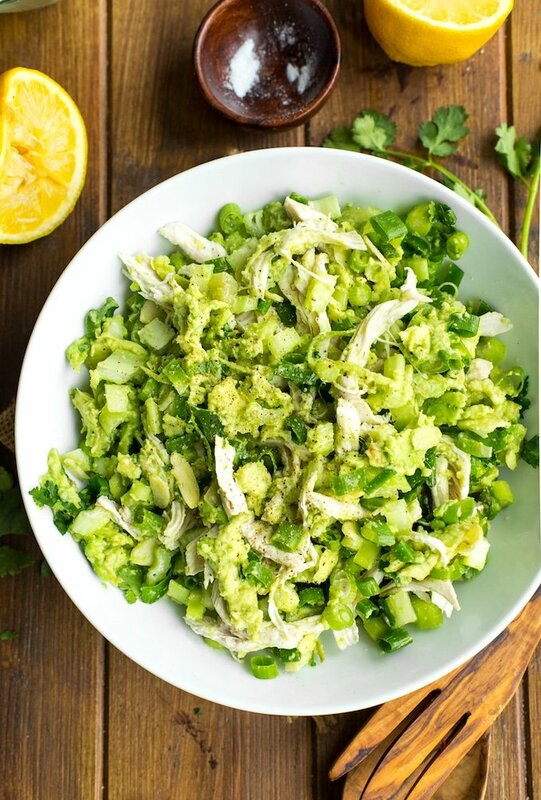 Once your avocados are all mashed up and mixed with the lemon juice mix in the chopped celery, spring onions, slivered almonds and herbs followed by some shredded chicken. I include instructions for how to quickly poach your chicken but as I mentioned a second ago you can use precooked chicken here – shredded or chopped will do. Then just season with a some salt and pepper and you’re good to go! Stuff this into sandwiches to enjoy or just eat it as is or in lettuce wraps to keep it low carb/Whole30 friendly. 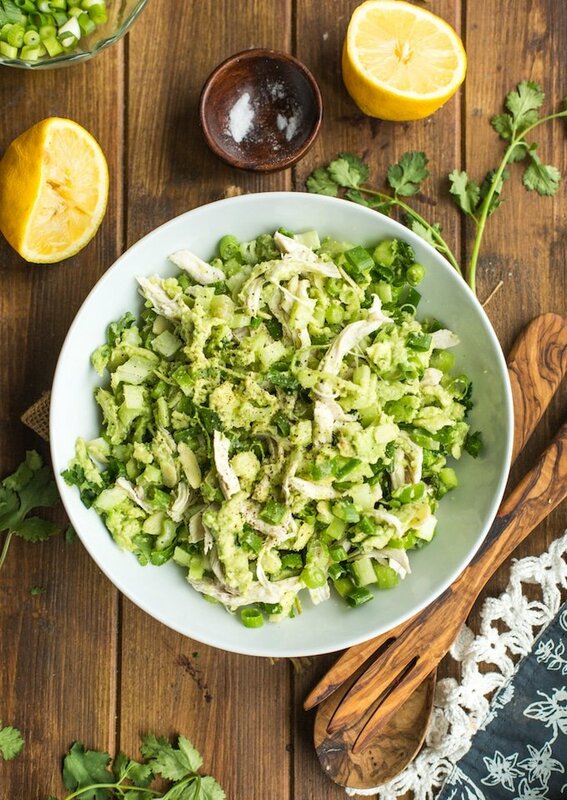 Don’t forget to #asaucykitchen on instagram if you try this Avocado Chicken Salad! We love seeing what you make! You can also post your pictures to my facebook page! 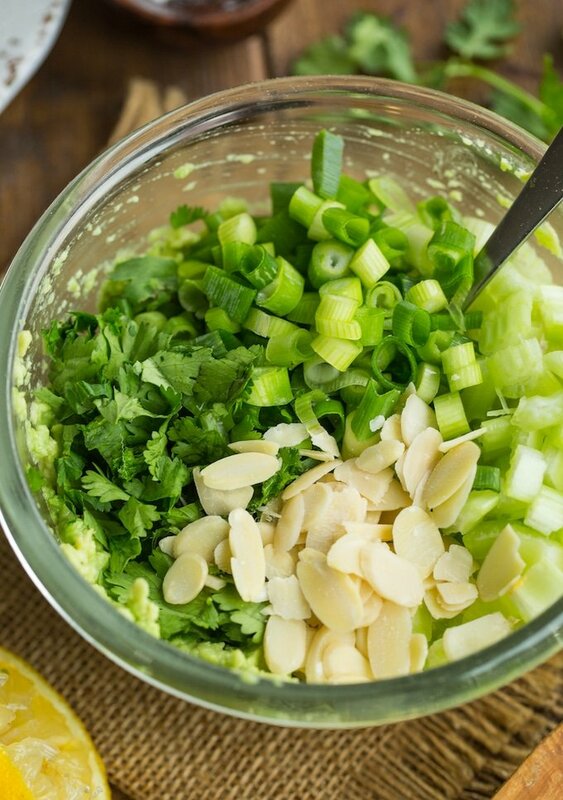 Add the avocados and lemon juice to a large salad bowl. Mash with a fork until little to no lumps remain. Stir in the celery, spring onions and herbs along with the shredded chicken breasts. Taste and season with more salt and pepper as needed and enjoy! Serve as is, in lettuce wraps or as a sandwich. Just made this and I am amazed at how good and flavorful it is! I used a rotisserie chicken to speed up the process. Will definitely make this again. Thanks for coming back to let me know what you thought – so glad you liked it! Made this today and wrapped it in lettuce leaves and it was very good. 🙂 Made it for friends and they loved it. Thank you! That’s awesome – glad you all enjoyed it! Thanks Noelle! Yay! So glad you liked it! Thanks for coming back to let me know what you thought!